This online Practice Test will enable you to have realistic preparation before going to a College, Training Provider or Employer for an interview or assessment day. The Practice Test follows a similar format to most assessments and will be helpful towards any other tests you may be required to take. Suitable for all career pathways including Level 2 Intermediate, Level 3 Advanced and Higher Apprenticeships. Suitable for all career pathways including Foundation and Modern Apprenticeships. How can I purchase this online practice test? Click on the add to basket button on this page to purchase this test. When can I start this practice test? As soon as we receive notification from our provider of your purchase we will email you all the details to enable you to access the online test. How do I know what I have scored? A report showing your score is displayed immediately you complete the test. You can then access your right and wrong answers. Who writes this practice test? 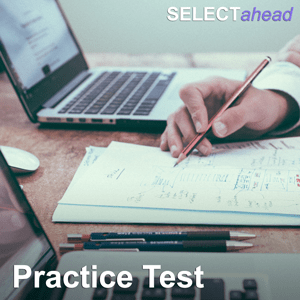 This Practice Test has been written by the same author who has developed all the Selectahead Assessments used extensively by Colleges of Further Education, Training Providers and Employers. This is not an automated system. On most occasions you will receive your details within 15 minutes of us receiving your purchase notification, however very occasionally this may take up to 3 hours. If your purchase is very late at night you will not receive your details until the next morning.